This farm will catch your eye as you travel near Brownton, MN. It’s definitely not a traditional color for a barn. The farm is well kept up. There is even a small pink dog house hear the light pole in the yard. This entry was posted in Uncategorized and tagged barn, blue sky, copyright ryan ware, family farm, farm site, out buildings. Bookmark the permalink. This is a first, a pink barn. I can’t say as I like it. Do you think the color pays tribute to the fight against breast cancer? 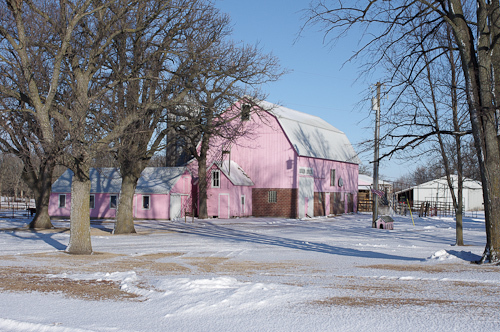 I was by there the other day, and it’s now a deeper shade of pink as they’ve covered the barn with steel. I actually didn’t mind the light pink, I’m not a fan of the darker pink. I’ve no idea the origin of the pink, but they are committed, that’s for certain. I’d say this is more of a husband’s lost bet with the farm wife than a tribute to breast cancer, but who knows. Funny find! Pink in color since the barn was built in 1904, a barn between Glencoe and Brownton catches people’s eye just off Highway 212. Thank you Don for the information on the “pink farm”. It’s one of a kind for sure. You have some wonderful barns and other photos at Flickr. I just thought I should reply on this seeing as my husband & I are the owners of the “Pink Farm”. Don has it all correct. We are in the Barns of Minnesota book by Ohman. Many people assume many reason for the color but sorry to say, the truth is no one really knows. It is correct that it was lighter in the early years. In 2000 we started making it darker. It last a lot longer and seeing as we had our twin daughters graduating that year and we had four daughters thought it should be a real standout. We are proud that our farm is so recognizable, most people use it as a landmark. We have been in magazines, newspapers and also on WCCO TV. This tradition of Pink does not have its start within our family but as long as we live here we plan to respect the tradition. PS We are also written up and acknowledged in the McLeod County Historical Society.